Boutique hotel with personality for a remarkable travel experience. 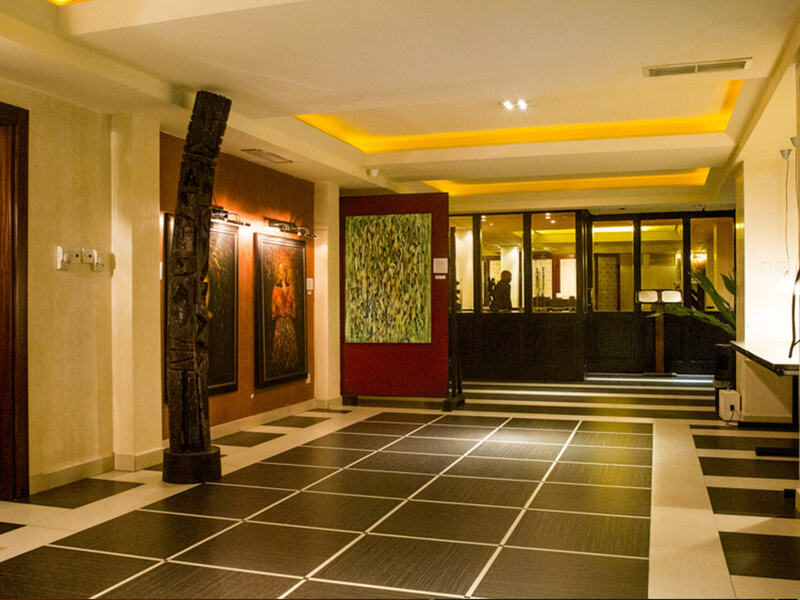 The cosy Hotel Mercure The Moorhouse Ikoyi-Lagos boasts a stylish African design with exotic wood accents, offers 90 well equiped comfortable rooms, a fitness room, an outdoor swimming pool with a relaxing ambience, a wine bar and an International restaurant mixed with African flavours. It's the ideal choise for professional business travellers who will enjoy free WIFI and the comfort of 4 meeting rooms and 1 Board room. Our 37 m² Superior room, recently renovated, cozy and stylish will provide you with all the comfort you need, in a relaxing ambience. Provided with tea and coffee machine and minibar on request. Privilege Room - 1 King size bed. Our privelege room is a 40 m² comfort space with exclusive upscale Mercure bedding and other little details that create the perfect environment for work or relaxation, rain shower, tea and coffee facilities and minibar on request. Well done to all of you. I will surely stop there again. The neighnorhood is quiet and secured. It was good but i was not happy with having to call each time to bring towel to my room. Other hotels i have stayed the one who comes to clean the room, replaces whatever that is not there or goes to get it before he/she leaves that room. Twice i have stayed there, twice i have requested for towels almost odd hours of the night. That's a no no. Secondly, ants always present on the table in the room I stayed. Dear Mr. S., Thank you for taking the time to tell us about your experience at the Mercure The Moorhouse Ikoyi Lagos. I am sorry that your experience did not meet your expectations; please allow me to express my sincerest apologies. At Mercure, we strive to provide a superior service experience for every customer; therefore your feedback is very important to us. Please rest assured that we are taking the appropriate measures to address the problem and prevent future occurrence. We appreciate your sharing your concerns, and it is our hope that you will give us the opportunity to better serve you in the near future. Sincerely, Amaka Ogu, Front Office Manager. No towel in the room, no soap, no TV remote. No telephone directory in the room. In fact it takes hours before they could provide me with TV remote, by the time it was provided, I was already sleeping. I went to the restaurant though after 10pm, but was told they have closed. It was the second day my colleague told me i could have placed room order. If such option is available, I felt I should be told. Room was good, so also the housekeeping and your staff. Dear Nnimmo B., Thank you for taking the time to tell us about your experience at the Mercure The Moorhouse Ikoyi Lagos. We would appreciate to know exactly where we did not meet your expectations, so as to strive to meet up. At Mercure, we strive to provide a superior service experience for every customer; therefore your feedback is very important to us. Please rest assured that we are taking the appropriate measures to address the problem and prevent future occurrence. Thank you again for reviewing your experience as we hope you will give us the opportunity to better serve you in the near future. Sincerely, Amaka Ogu. Front Office Manager. I have enjoyed my stay as much as necessary without complaints. It was good, had on time solution to my request and enjoyed the gym, would suggest an instructor on ground. I stayed for a short time. It was OK. The room service took very long to bring the food (+40m for a club sandwich). The first day was really okay, but the second day a room service personnel without knocking barged in, though apologized and said the room had been marked empty. Also, one of the employees did something impressive, which was he addressed me by my name and it really made me feel cool. I had warm reception from the front desk officer and the rooms were extremely comfortable. The personnel’s dedication is really amazing. The buiding is outdated. Dear Mr. Xavier I., Thank you for your positive back on personnel's dedication. I am sure that this feedback will serve as an encouragement to all of our staff as we strive to continuously improve the quality of our services. We are pleased to inform you that we have commence a total renovation of our building. This is from the indoor to outdoor. We hope by your next visit to Mercure The Moorhouse We must have met your expectation or supersede all of them. Thank you again for sharing your experience as we look forward to having you as our guest. Sincerely, Amaka Ogu, Front Office Manager. ( Mercure The Moorhouse).